This is really a dull post and I apologize. I have fun stuff going on but the secrecy of market projects is getting stale I know. 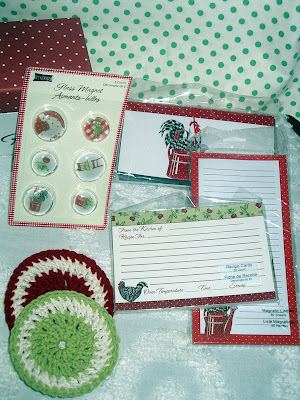 I feel fall and Christmas gently stalking me so I need to get these market projects done and move on or go back to my started projects. Time is moving rapidly and between now and Christmas there will be mad rushes from all of us to complete projects. 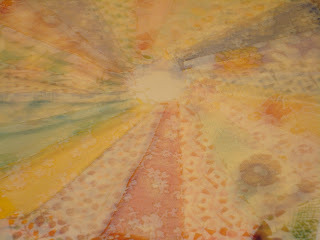 This is the back shot in a blur of my Dresden plate made with "Everything But the Kitchen Sink 2011". I think there are a total of 45 fabrics in this line. It is huge. I'm in the process of taking this $1.99 Kmart clothespin holder and using the hardware to make a clothespin holder from the panel that goes with "Kitchen Sink...". It won't be hard. 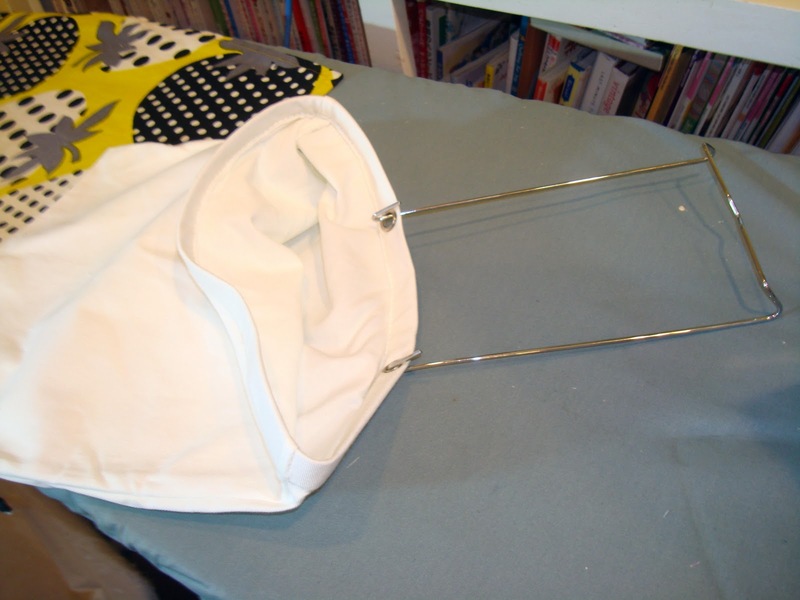 I can show the back side of my pot holders made from the panel. 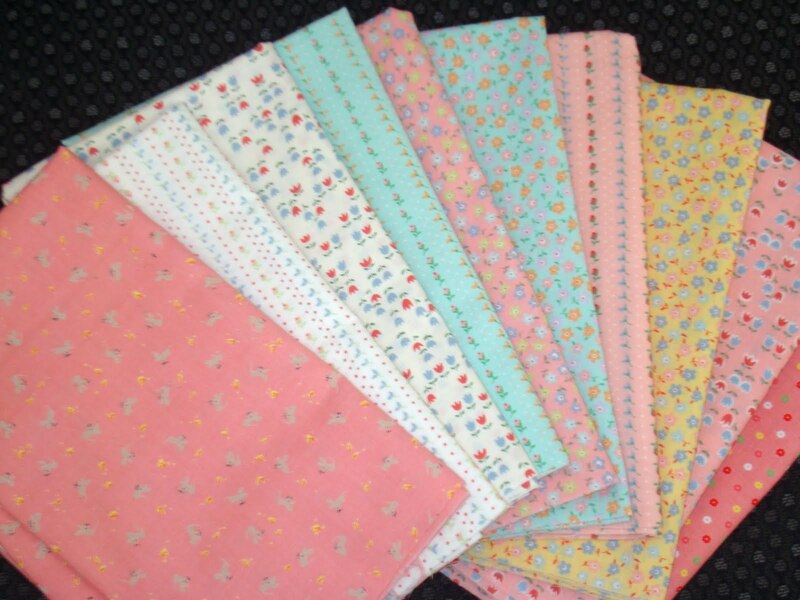 I've sewn patchwork binding on to them now, made from some of the 45 fabrics. I still have another couple projects cut out. I was supposed to have all these and my 3rd quilt mailed today. Mailing Monday is the best I can do. I hope that is okay. 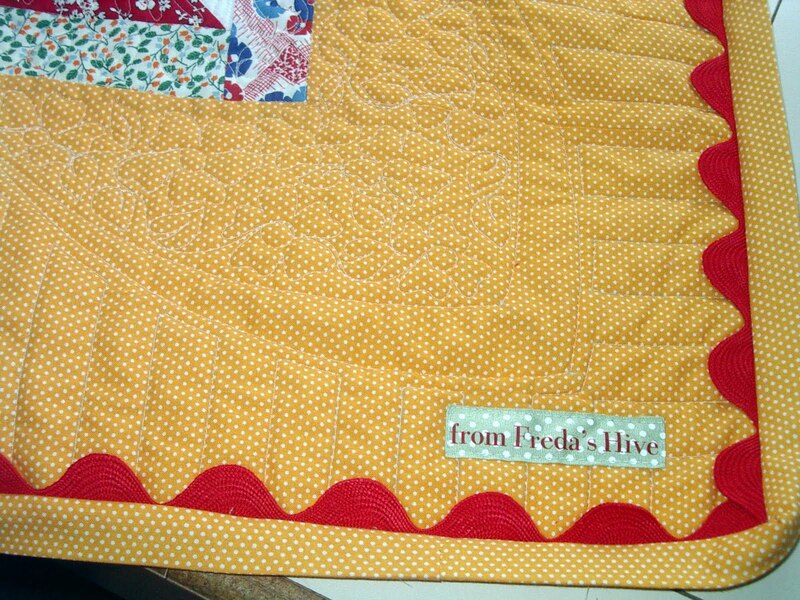 Our 2 day family retreat was all about Freda. 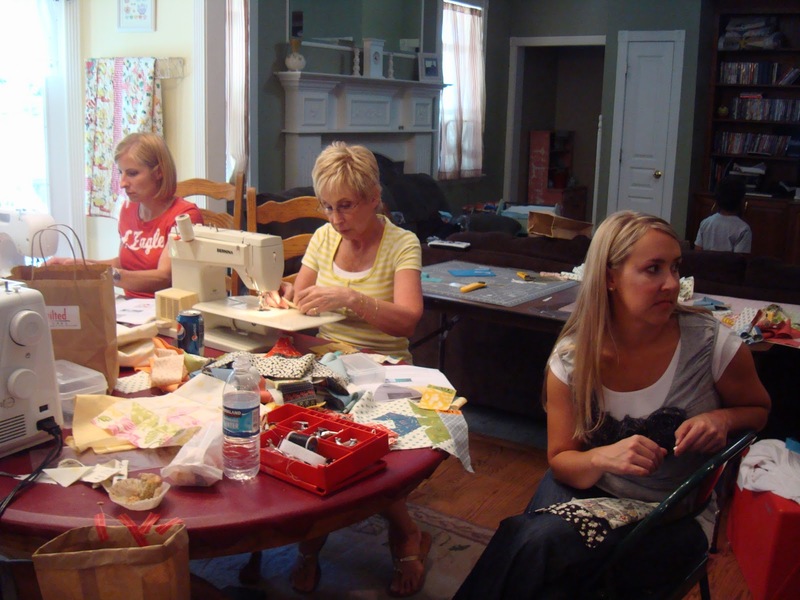 It is impossible to express my feelings about bringing our mother and grandmother into our little sewing event. There was no doubt about all of us feeling her spirit with us. 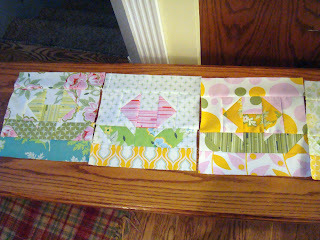 Saturday during our lunch break I gave a trunk show for the girls. 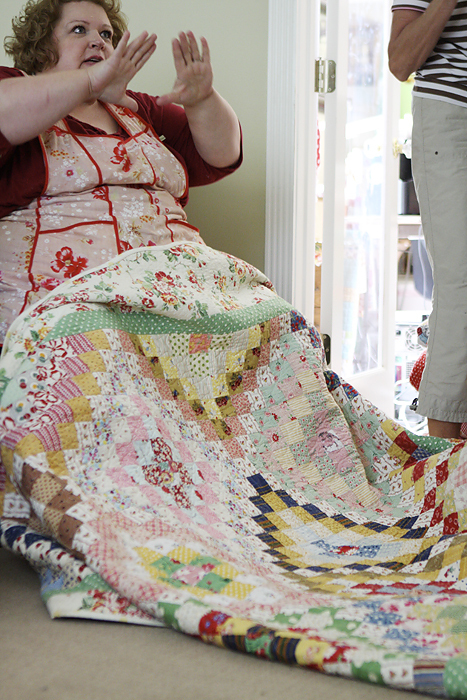 It was really fun to show them my quilts that have spanned more than 12 years. They were so kind to oooh and ahhh in the proper places! 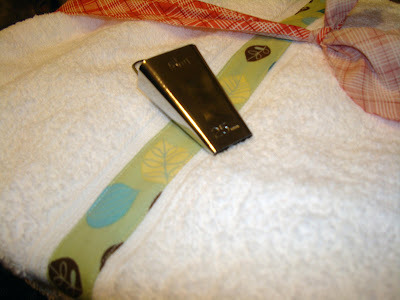 I had to swipe some pictures from my niece Jen's blog. She took such great photos of the event. 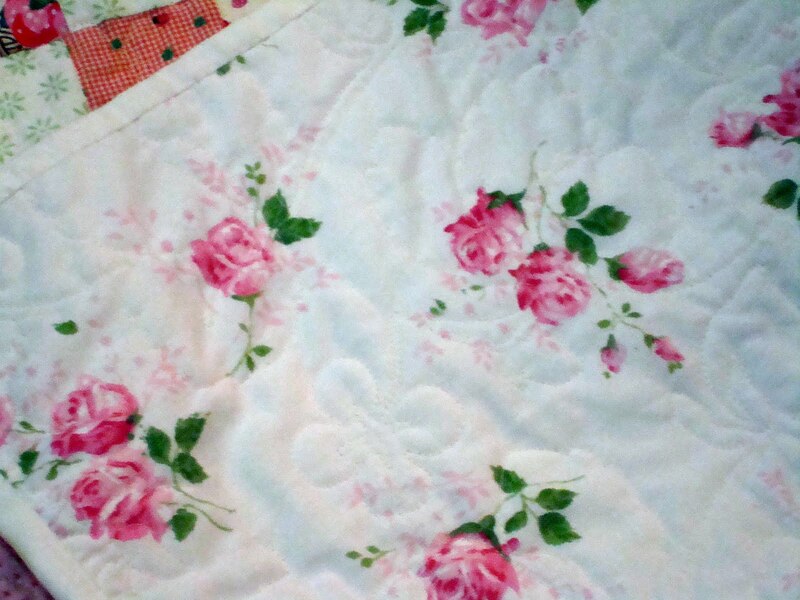 This 'trips around the world' quilt is one of my very very favorites because it was inspired by a quilt my mom, Freda, made me for my wedding more than 30 years ago. 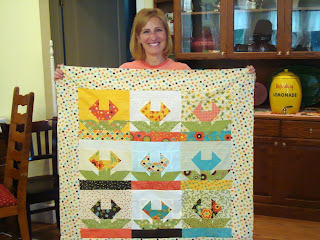 Here is Jen with her finished flimsy. 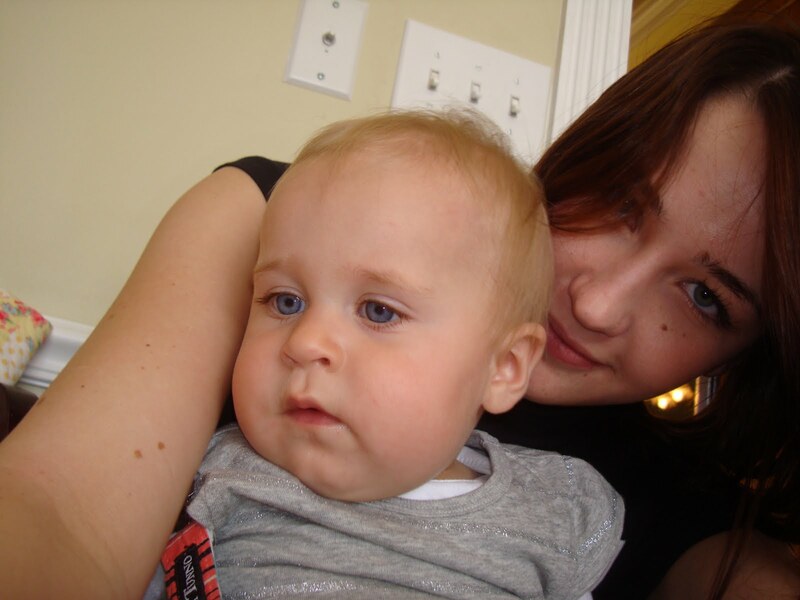 Jen is so talented. 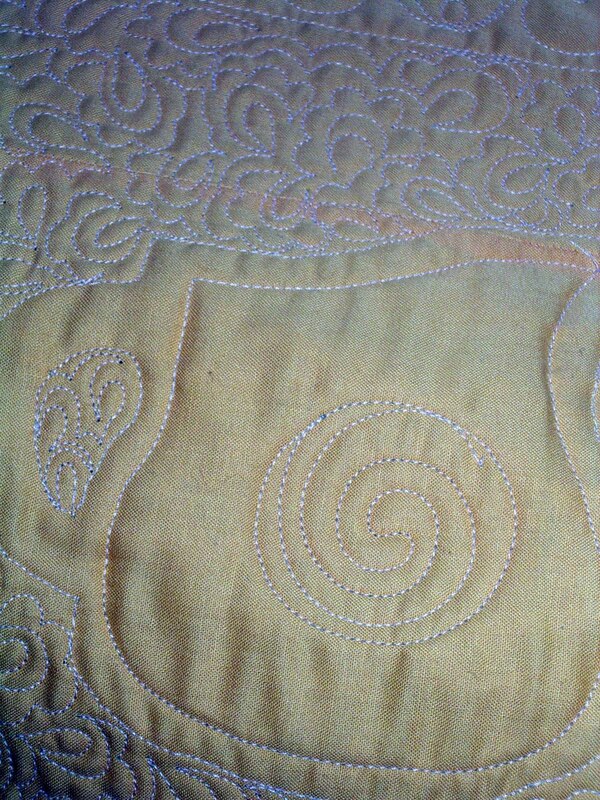 Her flimsy is pretty and the fabric made it so full of life and motion. I can't wait to see it quilted. 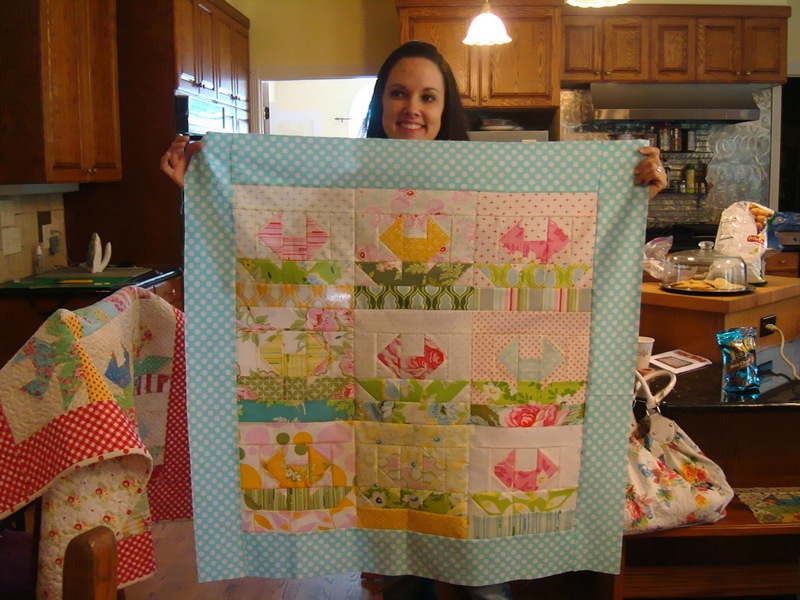 This is Amber with her quilt top. 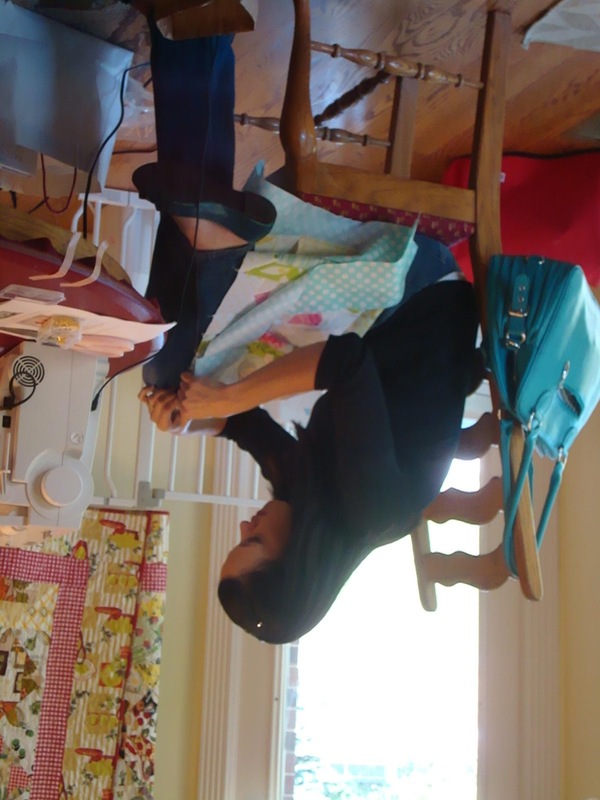 Amber is expecting and I never heard one complaint about sitting for 2 days sewing. Isn't her flimsy lovely. 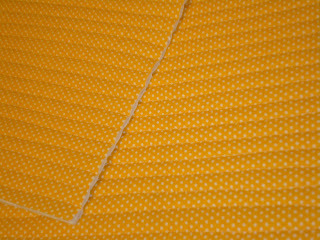 Tricia and Amber had the same fabric. But isn't it amazing how individual their tops look. Tricia was a trooper and would not stop until her top was done! This is my sister Michelle's top. Her fabric was a perfect choice for this quilt. As soon as she finished she started cleaning up. She always sets an example about hard work and is so thoughtful. This is Melanie's flimsy. Melanie is pregnant with twin boys after having 3 adorable girls. I couldn't be happier for her and since I'm also a mom of twins (as is my sister Michelle and my niece RaShelle) we had lots to talk about. 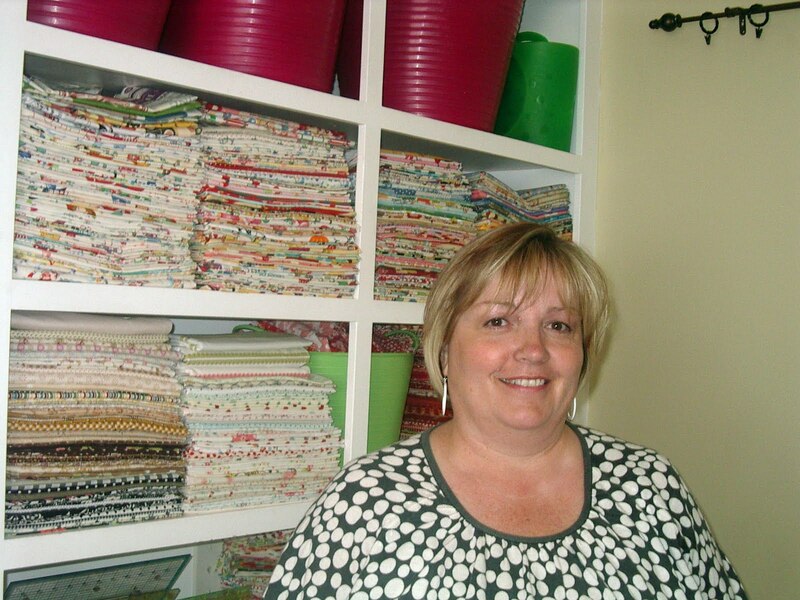 I love Melanie's fabric. Dream On is my favorite of the new Moda lines. It is fun to look at all the photos from our 2 days together. There is so much more and other quilt tops not quite finished, but I know they will be. Thank you girls for indulging my passion with me. Mom would be so so proud. Friday and Saturday last week was our first Freda's Retreat with daughters and granddaughters of Freda Nielson Breton, my mother. I was inspired to have a family retreat when I heard Jill Finley lecture and read her book. I am really happy to share the talents I picked up through my mother to the other women in the family. Above is my Freda's Flowers quilt, which was our project for the retreat. In my entry table is a photo of Freda, our favors and patterns in the giant teacup and the banana black walnut cupcakes from my mother's recipe. Banana nut cake was her absolute favorite. 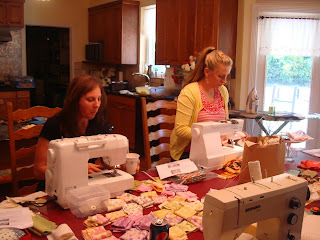 We sewed in my kitchen. A few of the girls had made quilts before but most had not. So it was really a learning experience. Left to right is my niece Tricia, sister Teri and niece RaShelle. Here is my niece Tana and niece Amber. These girls were all very hard at work. Sister Michelle is in front of the machine, sister Paula has her back to the camera, nieces Melanie and Vanessa and sister Teri in the corner of the photo. 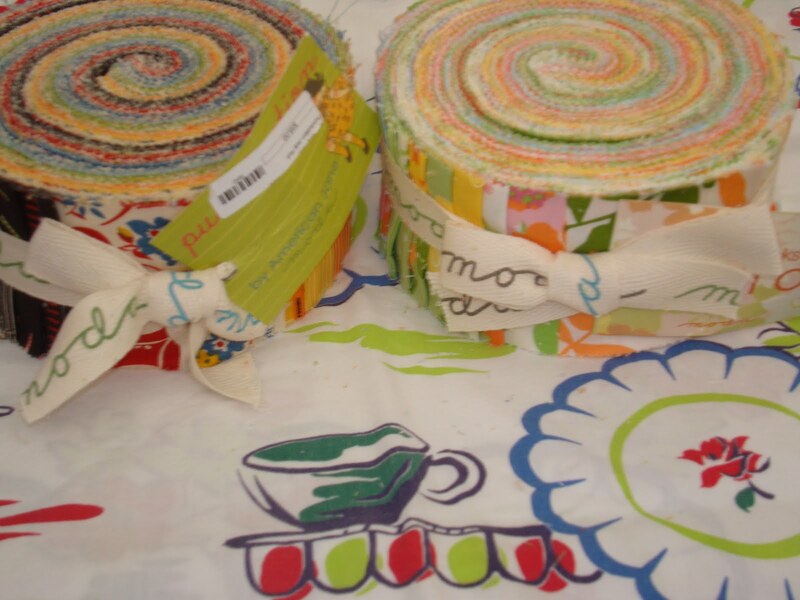 We used Jelly Rolls for our fabric. 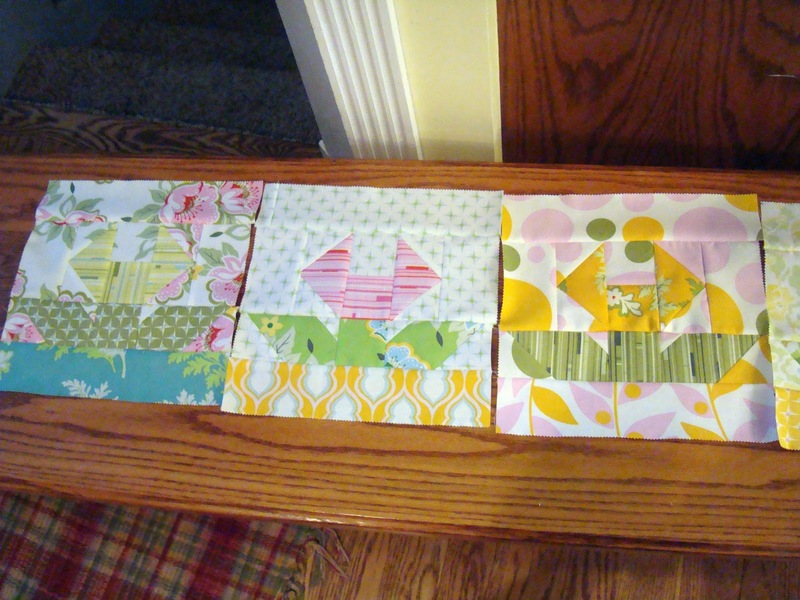 Above are Paula's blocks in Dream On. 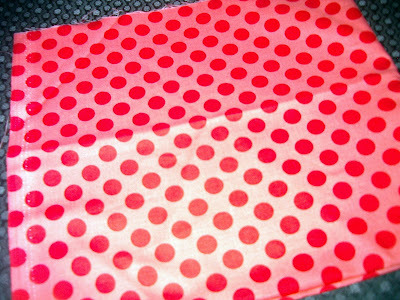 I really love this line of fabric. I think these are Jenny's blocks above. I love the prints and colors. These are Teri's blocks. I really like this new line from Sandy Klop. 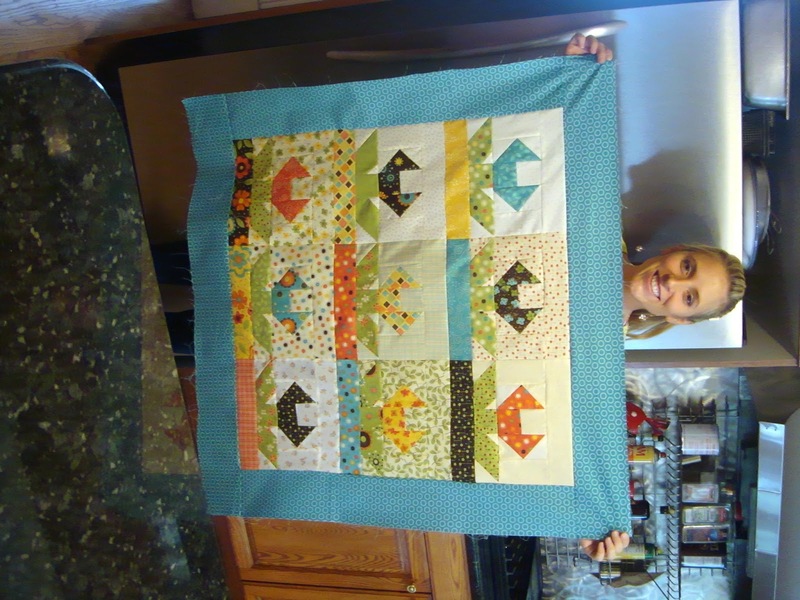 Here is my niece Jenny making her blocks. 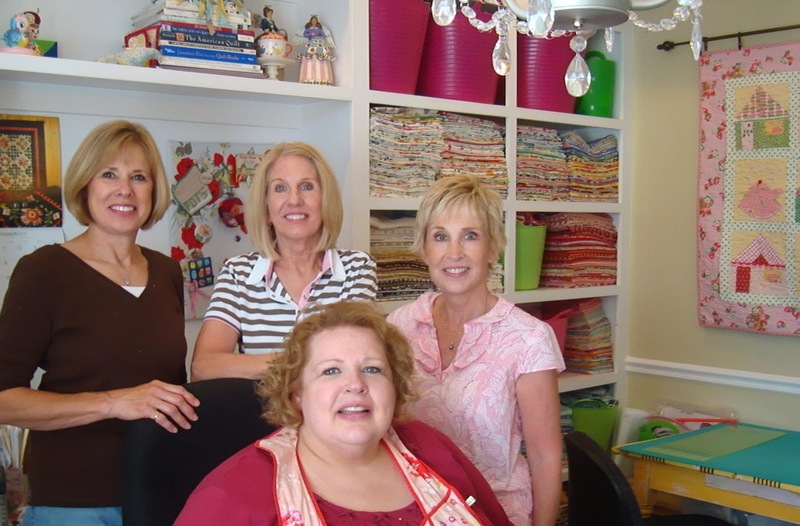 Michelle, Paula, Teri and me in my sewing room. We had a great time. 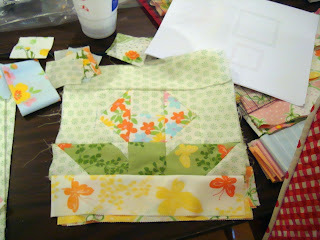 Tomorrow I'll show more pics of blocks making progress. I think everyone had a good time. I really loved getting together and dedicating our work and projects to my mother, Freda. So Blogger has new editiing capabilities. Let's just say "ABOUT TIME!". And I hope the features work (for me) and I learn to figure out how to use them. 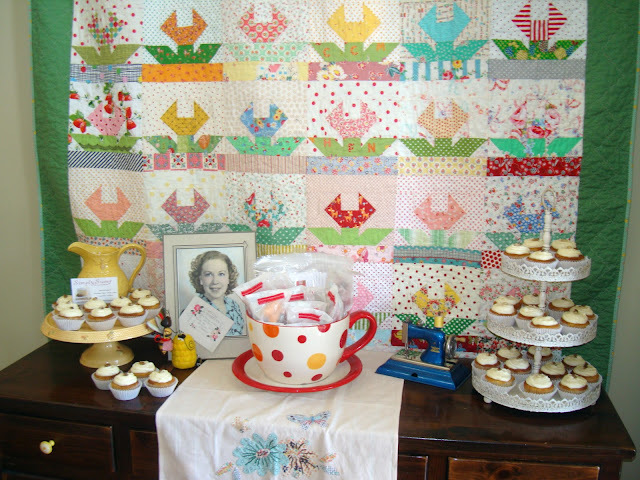 As most of you know I'm hosting a quilt retreat today and tomorrow at my house for my sisters and nieces that want to learn to quilt. Our theme is "Freda" for this retreat. 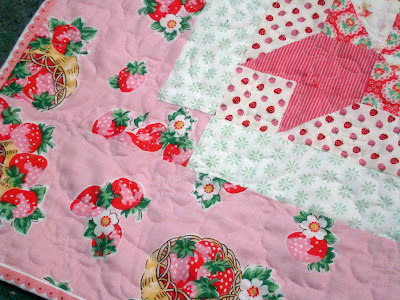 And we'll be making my "Freda's Flower's" quilt using jelly rolls. I've been thinking a lot about jelly rolls since I was in the sampler quilt this summer. And the thing I love to do is make up my own jelly rolls. 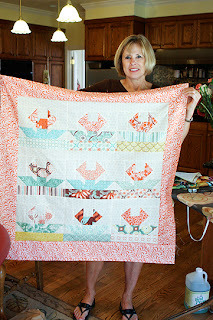 I wish more Etsy sellers would customize precuts sorta like Sew Mama Sew does with their fat quarter packs. Some other shops do that, too. I think that is more fun. I do like these 2 new Moda lines for precuts. The one on the left is Punctuation and the one on the right is Dream On. They are both really special. Speaking of special, the jelly rolls are on top of one of my favorite vintage pieces. I thought these Japanese tiny florals would make a good jelly roll. And I did have a jelly roll with some of these fabrics in before, but I used that for my sampler (along with other fabrics I pulled). 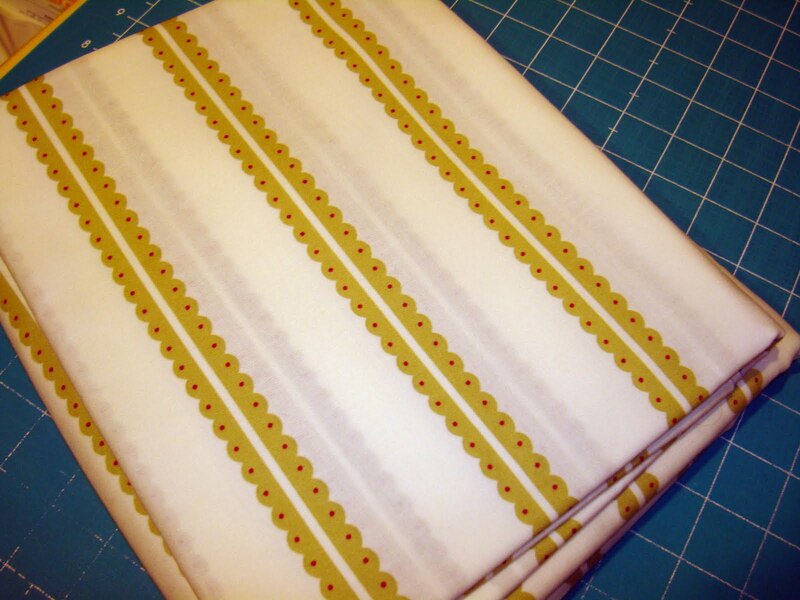 I just may make these prints into a small jelly roll by cutting my own 2 1/2" strips. So of course I'm busy with my retreat and so I'm posting ahead. 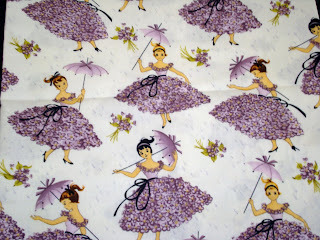 But I had to add this little Michael Miller fabric into my post today. It doesn't fit with the jelly roll idea but you have to admit they are pretty sweet. I've also been very busy with this little girl this week. She's been helping dry and bottle pears and (cough) "helping' me get ready for the retreat. Chelsey came from California for Jamie's birthday Wed. So she's been at our house, too. Busy busy at the hive! I will try to catch up on my comments and google reader next week (behind yet again). 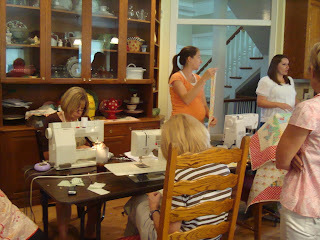 Friday and Saturday this week we are having a Breton Women Quilt Retreat at my house. Breton is my maiden name (Slovak name). I have 4 sisters. 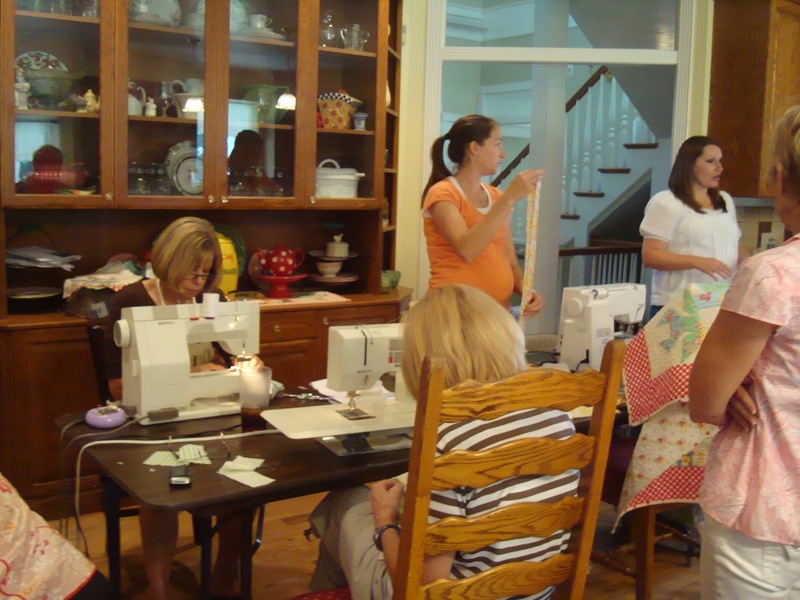 This is an opportunity for the women in our family to get together and honor our mother and grandmother Freda in sewing together. I'm so excited about it and I got the idea from Jill Finley's lecture and book. The sisters/moms decidid we would bring a few door prizes. I purchased some white bath sheets at a local discount store. 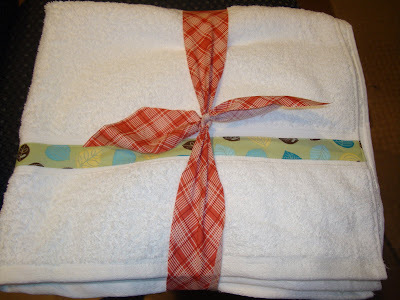 And I wanted to do something really simple to make them a little special and use towels for a door prize for the retreat. 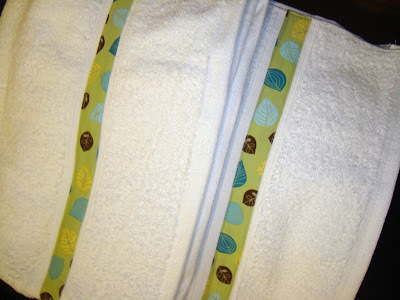 I cut strips of fabric 2" in a neutral fabric that might be ok in most any bathroom. I used my 1" bias strip maker (I cut the strips on the straight of grain this time) to turn the edges under and get the strips ready to sew on the towels. It was really easy and took under a half hour. I think it is a great idea. 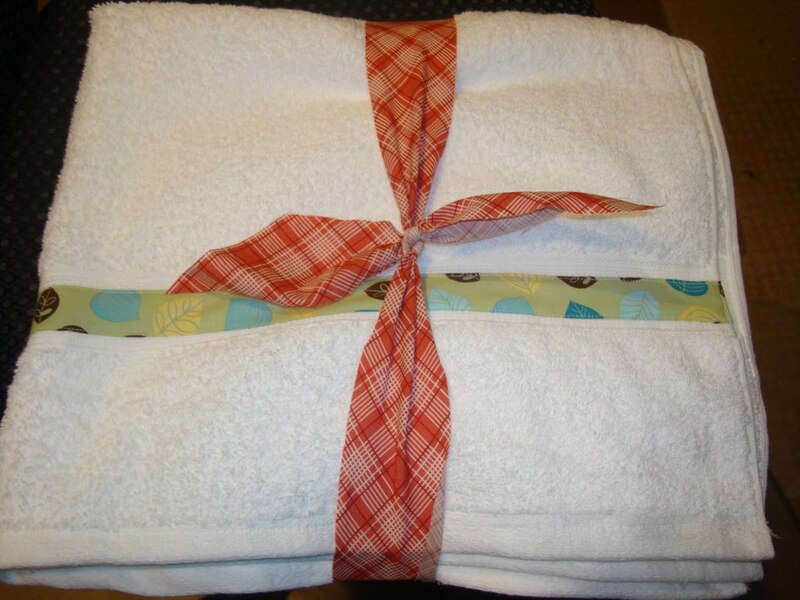 Who doesn't want new fresh towels? Anyone can use them. You know me by now. I always complicate things by throwing too much in the mix. 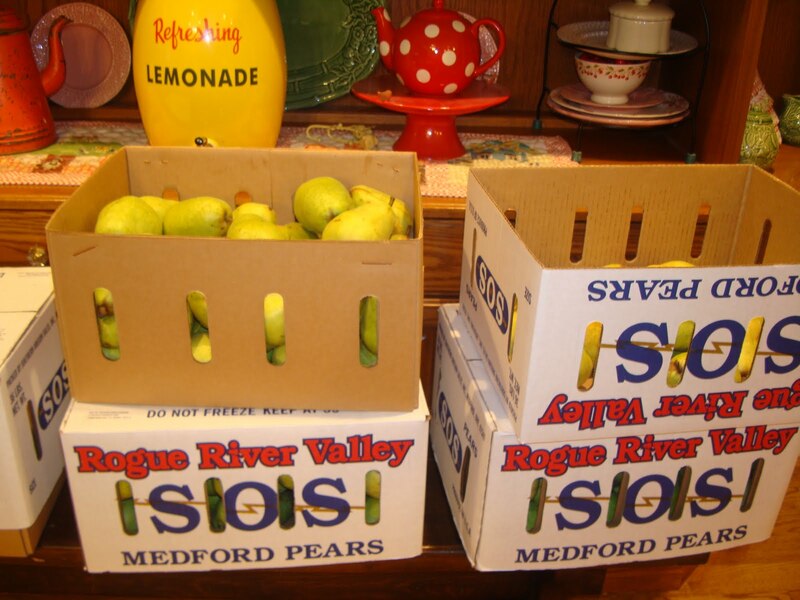 I purchased 4 boxes of fresh pears. They will all ripen this week, I'm pretty sure. Whitney wanted to bottle some for Allison and I like to dry them (our dried peaches are all gone already, for some reason my family will go eat the dried fruit and pass up the fresh fruit? crazy). So after work I'll have to do a little bit at a time. Jamie's 20th birthday is Wednesday so I also have a birthday mid week before the retreat. And my SIL Justin came home from his Army training. Lots going on but good stuff. I'm really looking forward to the retreat at the end of the week. 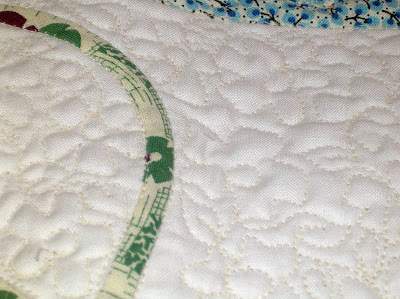 I've had my Jelly Roll Sampler Quilt back from being machine quilted for a couple weeks now but I've been consumed with market projects. 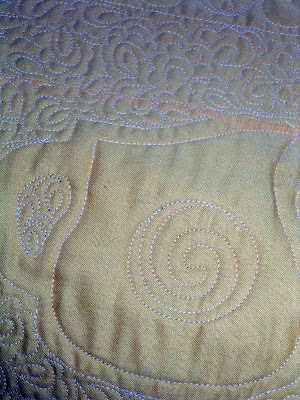 I am still working my next deadline before market but I took an afternoon to get my Jelly Roll quilt bound. I needed a break. 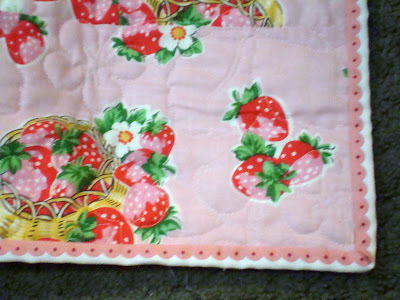 I had the sampler quilted with strawberries since that was the theme of the quilt. It is hard to tell from the photographs but I really like it. You might be able to pick out some blossoms and leaves from this photo. 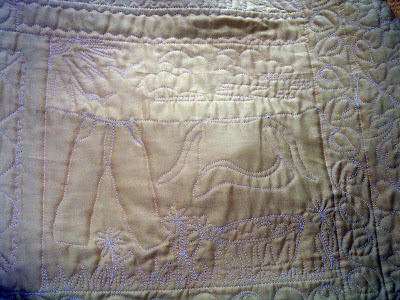 I used a vintage sheet for the back. Maybe you can see a strawberry here or there in this shot. 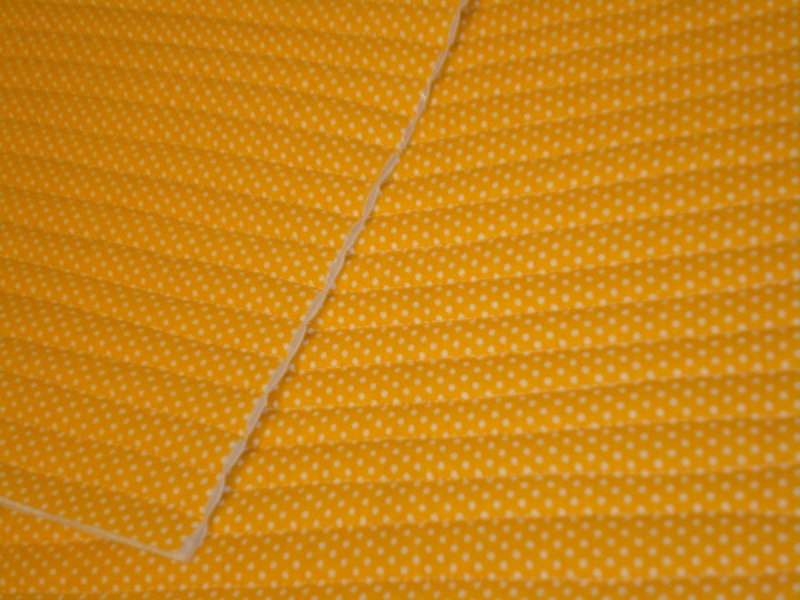 I bound the quilt in a scalloped fabric that makes it look like the edge of the border goes into the binding. I really love that look. I have the fabric by Michelle Blackhurst in pink and green and it is especially great for bindings, but tricky to cut. Allison came to see us Sunday. 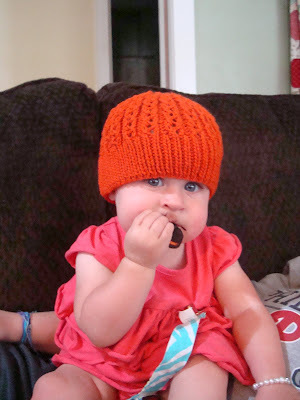 She is trying on the new hat Shelbie made her for fall. Allison LOVES cookies. Yes, it is a bit messy but impossible to take away from her, and she loves them. So it is cute to watch her eat a treat now and then. 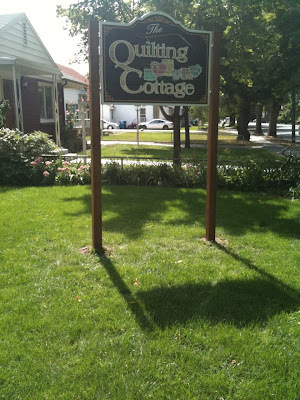 During my day with Lori Holt we stopped in to see the new location for the Quilting Cottage in American Fork, Utah. Just last weekend the store moved next door. So it is still located right by the library. 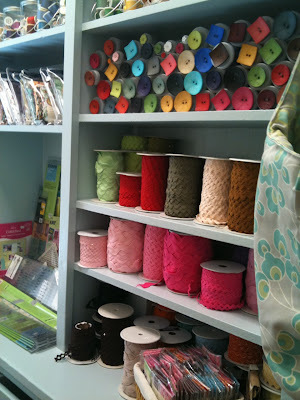 The new shop is full of light and everything is organized really well. They are still getting things situated but it will be great. You can see it was a lovely day to be shopping with Lori. 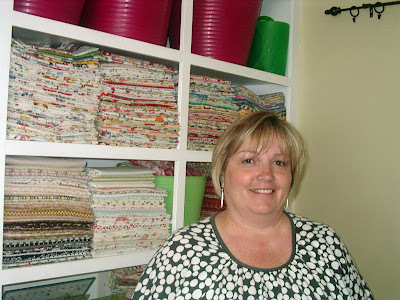 My wonderful friend Suzanne manages the shop and does a lovely job. It was fun to be greeted by her friendly face and shown around the store. Suzanne is such a great example of a strong optimistic person. I love her. They still have a great selection of fabric including my favorite 30s. 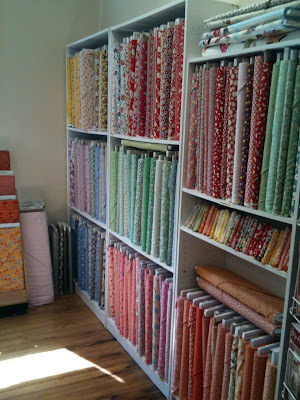 I always see fabric here that I've missed in other shops. I had fun peeking into each room. We ran into the girls from Riley Blake while we were there, too. Darn no picture of them! 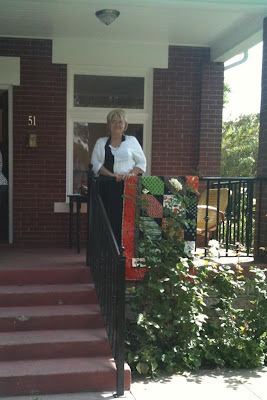 Remember I won a generous gift certificate from The Quilting Cottage over Shop Hop this summer. 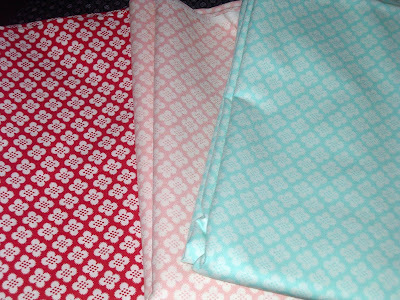 So for Fabric Friday I need to show you some of the fabrics I picked. I love Bliss by the wonderful Bonnie and Camille at Cotton Way for Moda. This pattern is such a great timeless design. I had to have it in 3 colorways. Lori and I both got some of this sweet daisy. And we both got some of this red dot on orange. I couldn't pass it up. It just spoke to me. And this brown dot tulip spoke to me too. 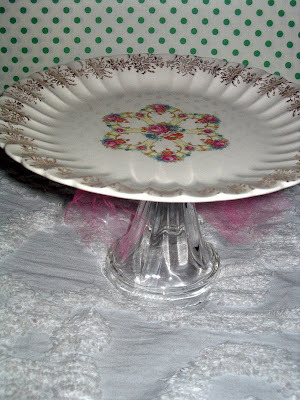 Love the vintage pattern and colors. I also got some of this timeless green dot. This is a re-buy for me. 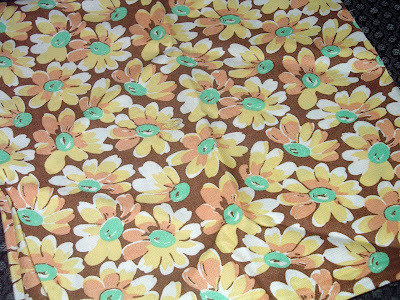 I've had this fabric before and it makes such a great neutral and binding fabric. I was glad they still had it. 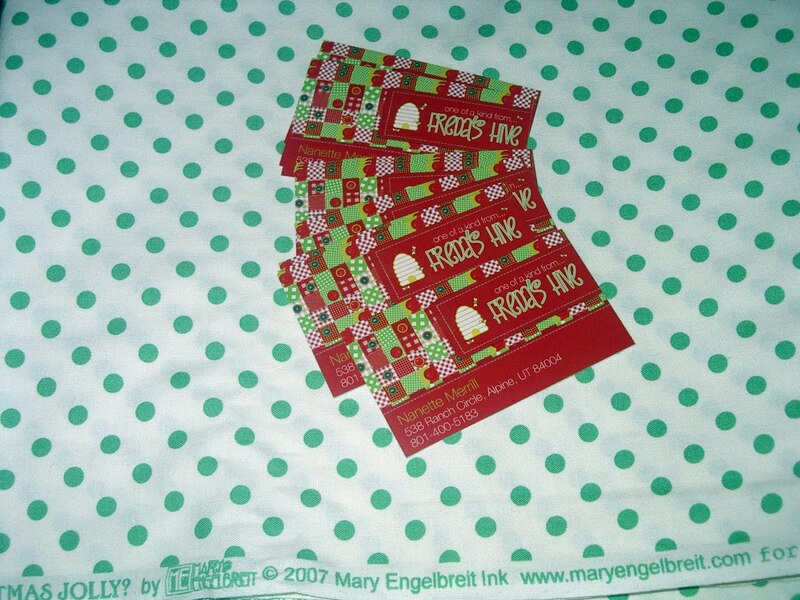 On top of the green dot are my new business cards. They came in the mail yesterday so I was excited to open them up and feel them and look at them. The colors don't show exactly how they really are in this picture but I am very pleased with them. 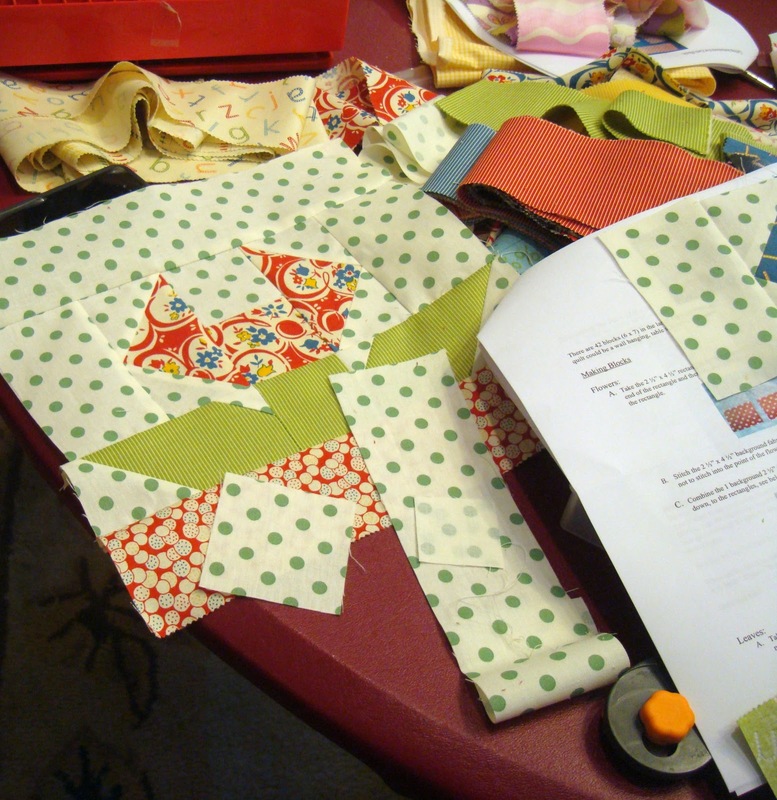 Maybe I'll have time to bind and work on some works-in-progress this weekend. Hope so. The famous, talented and lovely Lori Holt and I have planned a date together for months. Both of us have very busy schedules and it was challenging to find time that worked for both of us. So it was with much anticipation that we got together yesterday. Brown hamburger, saute vegetables, drain. Add salsa, corn, beans and seasonings. Mix together. Pam spray your baking dish and put the mixture in the baking dish. 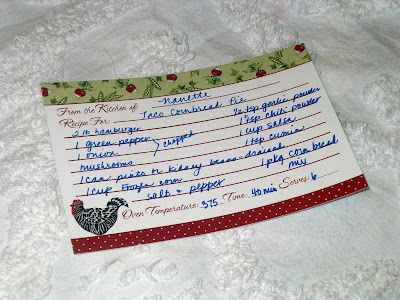 Follow package directions for cornbread mix (I used Krustez) and then spread cornbread mix on top of the taco ingredients. Bake at 375 convection for 35 (plus or minus, depending on your oven) minutes. 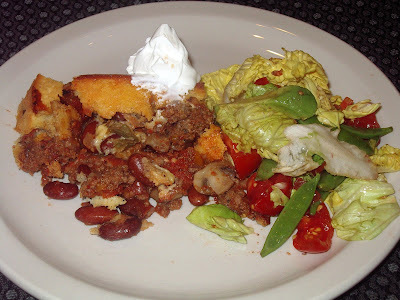 Serve with a salad and top with sour cream. I had a great time with Lori. She's such a great girl. I can't say enough about the machine quilting in my projects for International Quilt Market in Houston next month. Most of you know I am making projects for RJR's latest "Everything But the Kitchen Sink" fabric - 30's fabric line. 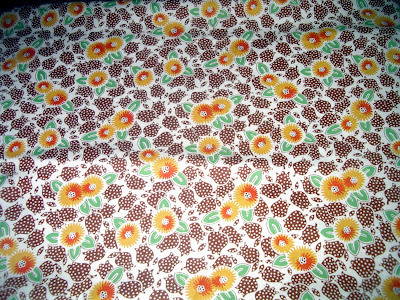 I showed you a bit of my table topper already, done in an edge to edge pattern called feathered flowers by Wendy of Eagle Mountain Quilting. She did perfect job for the table topper. My custom quilter Wren of Sew Small Sitches just finished my main market quilt. 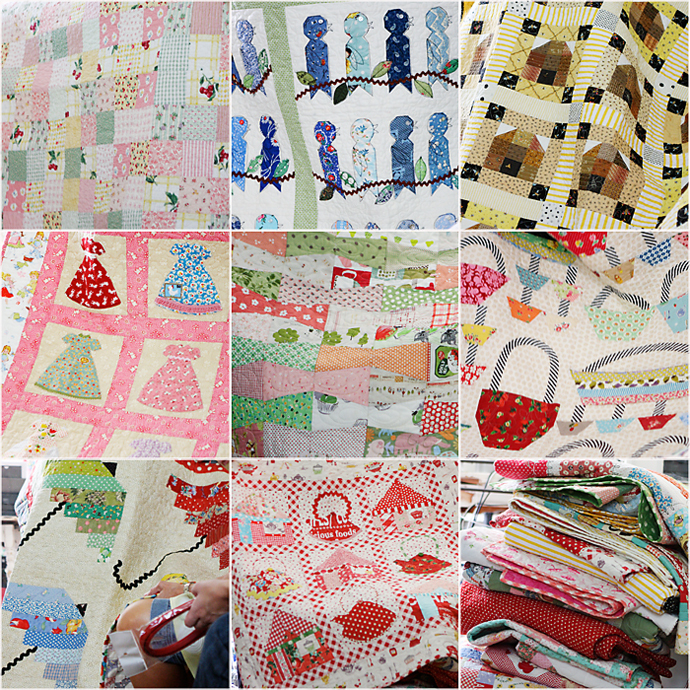 I can't say enough about Wren's skills and the attention to detail in my market quilt. I can't wait for you to see the whole thing. But of course I can't reveal until market time. But I can show you some sneak peaks. 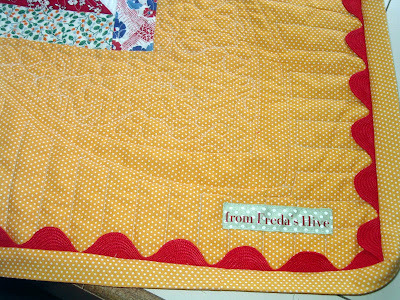 Above in the pic is the border for my quilt titled "Happy Homemaker - Everyone needs a Chef" I'm not finished hand stitching the binding down yet. 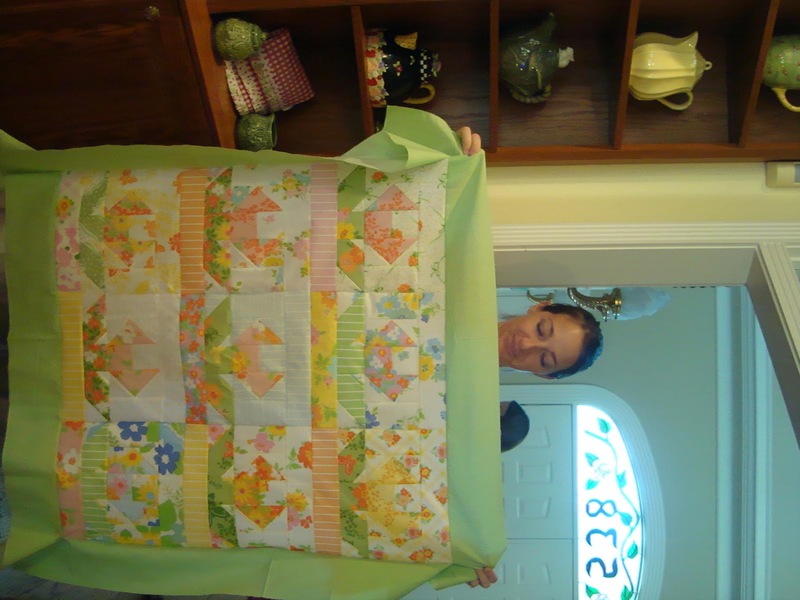 But I love my giant rick rack and how it goes with Wren's border stitching. There are 10 blocks with applique in the quilt and 6 blocks cut from a panel. 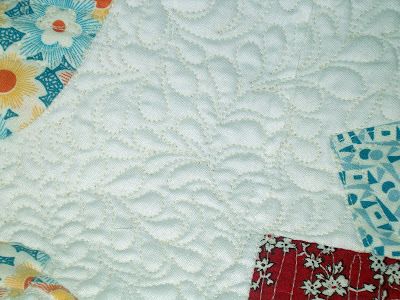 Each applique block is quilted uniquely. 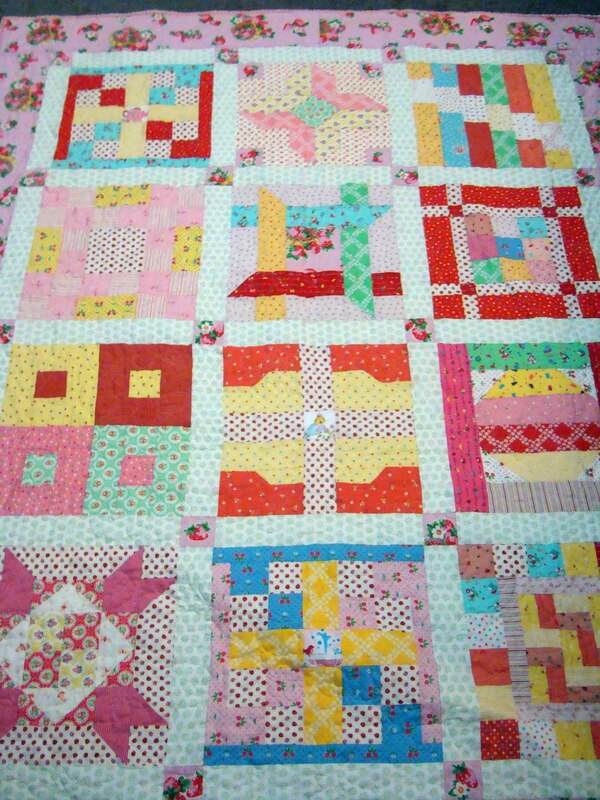 Each block has an individual personality. And I adore each design. This is the back of one of my blocks. 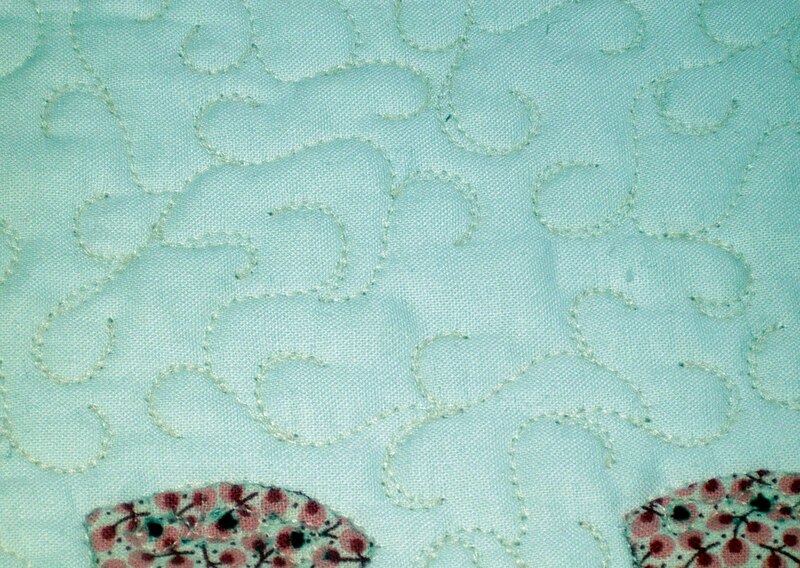 Can you believe the crazy detail from Wren's quilting? 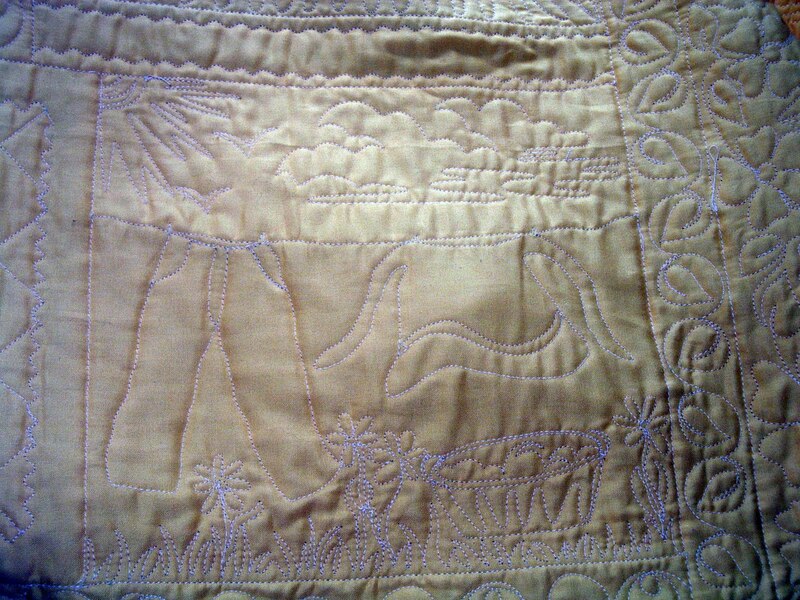 Here is another showing the back side of the quilt. It is really fantastic. If you are going to quilt market you must drop by the RJR booth and see Wren and Wendy's work. Well, and mine, too ;-).